Boat International was the first to reveal details of Sailing Yacht A, with an exclusive look at the boundary pushing superyacht. Now we expose all the facts behind the build of this incredible superyacht commissioned by Andrey Melnichenko. As owner of Motor Yacht A, another divisive yacht, we knew Sailing Yacht A would be anything but conventional. Melnichenko is one owner who delights in challenging the status quo and moving the game on, introducing new techniques and technologies in his yacht projects. Sailing Yacht A ticks both boxes: at 142.81 metres LOA, it is the largest boat of its kind in the world, and is being called a “sail-assisted motor yacht” – though many consider her to be the new largest sailing yacht in the world. Working once again with Philippe Starck on the design, Melnichenko assembled his own team to take the project from concept to completion. He chose Dirk Kloosterman, a veteran project manager of superyacht builds, to lead it. Kloosterman was involved in the build of Larry Ellison’s Rising Sun before taking on Motor Yacht A for Melnichenko. Click here to see the infographic in a bigger size. Sailing Yacht A is his biggest undertaking. Kloosterman’s first challenge was to find a shipyard with the capabilities to build such a vessel.Few major deep-water shipyards wanted to take on the riskof such a radical project, but Nobiskrug’s purchase of part of the HDW yard in Kiel, Germany, presented an opportunity. Sailing Yacht A is a sharp, three-masted motor yacht with sailing potential, constructed mostly in steel incorporating composite and carbon fibre to keep weight down. In profile from her high bow, the sheerline climbs aft, before dropping down to an almost retroussé stern. The line is seamless, without interruption or sight of any deck equipment, anchors, balconies or openings of any kind, but they are all there, cleverly hidden away. Astonishingly, there are 24 shell doors in the hull. The windows, which are all oval, look small from a distance, but all have a magnifying effect, making them seem huge from the inside. During our visit tests were under way on a special one-way film to cover the exterior of the glass for privacy and to blend them into the custom metallic paint finish by Alexseal. Her scale is extraordinary: 142.81 metres LOA, with a maximum beam of 24.88 metres and a draught of eight metres. She has eight decks, connected by multiple elevators and free-floating spiral staircases, garages for four tenders and a submarine, as well as a touch-and-go helipad on the bow. Every part of her interior has been designed to be flowing and organic. Although the yacht was still a building site when we visited, with Vedder, Deutsche Werkstätten and Sinnex busy with the fit-out, there was no mistaking the incredible living space available for the owners, their guests and up to 54 crew, who will run a professional galley large enough to serve a hotel and a powerplant and hotel services stretching uninterrupted across two decks. In contrast to the volume of the everyday living accommodation is arguably the most incredible feature on board, occupying the smallest space: an underwater viewing pod moulded into the keel, offering a view of the props. To make sure it all worked, hydrodynamic research facility HSVA in Hamburg performed towing tests for the hull, and the Wolfson Unit at the University of Southampton carried out wind tunnel tests to determine aerodynamic loads. This phase of the project revealed the optimal combination of sailing characteristics, seakeeping behaviour and performance under power. MARIN, in the Netherlands, conducted final tests of the model with keel and rudders. With simulated aerodynamic loads applied, results concluded that the yacht’s heeling angle when under full sail would be a maximum of 12 degrees at 20 knots true wind-speed upwind and 35 knots downwind. Sailing Yacht A is a sharp, three-masted motor yacht with sailing potential, constructed mostly in steel incorporating composite and carbon fibre to keep weight down. In profile from her high bow, the sheerline climbs aft, before dropping down to an almost retroussé stern. The line is seamless, without interruption or sight of any deck equipment, anchors, balconies or openings of any kind, but they are all there, cleverly hidden away. Astonishingly, there are 24 shell doors in the hull. The windows, which are all oval, look small from a distance, but all have a magnifying effect, making them seem huge from the inside. During our visit tests were under way on a special one-way film to cover the exterior of the glass for privacy and to blend them into the custom metallic paint finish by Alexseal. Her scale is extraordinary: 142.81 metres LOA, with a maximum beam of 24.88 metres and a draught of eight metres. She has eight decks, connected by multiple elevators and free-floating spiral staircases, garages for four tenders and a submarine, as well as a touch-and-go helipad on the bow. Every part of her interior has been designed to be flowing and organic. Although the yacht was still a building site when we visited, with Vedder, Deutsche Werkstätten and Sinnex busy with the fit-out, there was no mistaking the incredible living space available for the owners, their guests and up to 54 crew, who will run a professional galley large enough to serve a hotel and a powerplant and hotel services stretching uninterrupted across two decks. In contrast to the volume of the everyday living accommodation is arguably the most incredible feature on board, occupying the smallest space: an underwater viewing pod moulded into the keel, offering a view of the props. To make sure it all worked, hydrodynamic research facility HSVA in Hamburg performed towing tests for the hull, and the Wolfson Unit at the University of Southampton carried out wind tunnel tests to determine aerodynamic loads. This phase of the project revealed the optimal combination of sailing characteristics, seakeeping behaviour and performance under power. 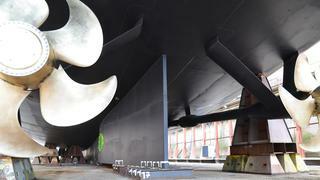 MARIN, in the Netherlands, conducted final tests of the model with keel and rudders. With simulated aerodynamic loads applied, results concluded that the yacht’s heeling angle when under full sail would be a maximum of 12 degrees at 20 knots true wind-speed upwind and 35 knots downwind. 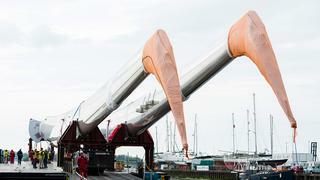 Three colossal unstayed masts – the largest carbon masts in the world – define Sailing Yacht A. The mainmast towers 100 metres above the waterline – taller than Big Ben. An enclosed electric gimballed crow’s nest is incorporated, to whoosh a crew member 60 metres up the mast for what will surely be one of the most amazing views on the water. Dykstra Naval Architects, the Dutch naval architect that designed the rig for Maltese Falcon, was the obvious choice to develop an easy-to-use and safe sailing system. Being “sail assisted”, the ratio between sail area and the yacht’s displacement is somewhat lower than would be found on a pure sailing yacht. Dykstra optimised the sailplan with full roach sails and freestanding aerodynamically efficient masts that can be rotated a total of 70 degrees to increase lift-drag characteristics. Curiously, the masts are curved. “When we started to design this rig,” explains Mark Leslie-Miller from Dykstra, “the distinct feature of the freeboard sloping up towards the stern was already defined. For styling reasons, we wanted the foot of the sails [thus the booms] to align with the sheerline.” Sails this big would need to furl rather than flake when not in use. Furling booms, however, have to be at 90 degrees to the mast in order to work. Rather than tip the entire mast forward to preserve the right angle, Dykstra designed in the curve to keep the design aligned. Magma Structures in Portsmouth, UK, developed the unique freestanding spars in carbon fibre, the only material that could cope with the stresses involved; masts this size cannot, in fact, be built using metals, according to Magma’s Damon Roberts, and they posed quite a challenge for the team. “Since the rig concept is unprecedented on this scale, there were no easy answers or standard solutions for any of the challenges that the rig design posed,” he says. 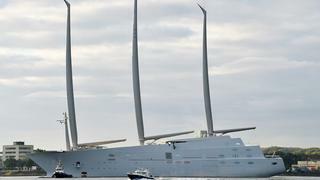 Three colossal unstayed masts – the largest carbon masts in the world – define Sailing Yacht A. The mainmast towers 100 metres above the waterline – taller than Big Ben. An enclosed electric gimballed crow’s nest is incorporated, to whoosh a crew member 60 metres up the mast for what will surely be one of the most amazing views on the water. Dykstra Naval Architects, the Dutch naval architect that designed the rig for Maltese Falcon, was the obvious choice to develop an easy-to-use and safe sailing system. Being “sail assisted”, the ratio between sail area and the yacht’s displacement is somewhat lower than would be found on a pure sailing yacht. Dykstra optimised the sailplan with full roach sails and freestanding aerodynamically efficient masts that can be rotated a total of 70 degrees to increase lift-drag characteristics. Curiously, the masts are curved. “When we started to design this rig,” explains Mark Leslie-Miller from Dykstra, “the distinct feature of the freeboard sloping up towards the stern was already defined. For styling reasons, we wanted the foot of the sails [thus the booms] to align with the sheerline.” Sails this big would need to furl rather than flake when not in use. Furling booms, however, have to be at 90 degrees to the mast in order to work. Rather than tip the entire mast forward to preserve the right angle, Dykstra designed in the curve to keep the design aligned. Magma Structures in Portsmouth, UK, developed the unique freestanding spars in carbon fibre, the only material that could cope with the stresses involved; masts this size cannot, in fact, be built using metals, according to Magma’s Damon Roberts, and they posed quite a challenge for the team. “Since the rig concept is unprecedented on this scale, there were no easy answers or standard solutions for any of the challenges that the rig design posed,” he says. With the masts designed to carry the whole load, they were able to calculate the maximum bending-force load on the lower bearing by using the predicted upper wind speed limit. “Allowable material stresses and safety factors then clearly led to the structural requirements for the design,” Roberts adds. The bending load at deck on the main mast, for instance, is about two-and-a-half times that of a Dreamliner aircraft wing and about two times that on Maltese Falcon, which has the highest-loaded freestanding masts to date. To put it another way, the masts can withstand 90 knots of wind with full sail up (equivalent to a Category 2 hurricane), or two double-decker buses hung from the tip of each. Magma built the masts using conventional female moulding techniques using high-strength carbon/epoxy prepreg laminate. Each mast was produced in four large sections: top and bottom, port and starboard. In the lower sections, 370 layers of carbon were laid up in open moulds. For the curing, Magma designed and manufactured oven software to monitor and control the cook cycle over a three-day period. Embedded in the masts is a network of fibre-optic sensors to give real-time comprehensive load data for safety, historical data, condition monitoring and sail performance optimisation. The total sail area of 3,747 square metres is equal to the size of half a football pitch, and is 67 per cent larger than Maltese Falcon’s 2,370 square metres. Unlike the many small sails that deploy from Falcon’s mainmast, Sailing Yacht A’s fully battened mainsail, at 1,464 square metres, is a single piece and furls on a carbon-fibre mandrel inside a U-shaped boom at the press of a button; no crew are required. The total length of fibre used in the sail is 754 miles, or long enough if pulled straight, to stretch from the shipyard in Kiel to Monaco. The sails, by Doyle Sailmakers of the US, are a combination of carbon and Technora fibres and covered with taffeta to protect them from UV. The trick was determining compression loads on the battens and then engineering a soft inboard end capable of furling reliably but, at the same time, handling the forward thrust of the battens without tearing. Future Fibres, in Valencia, constructed the carbon-fibre booms, which measure 25 metres (foresail), 27.5 metres (mainsail) and 23.6 metres (mizzen). With the masts designed to carry the whole load, they were able to calculate the maximum bending-force load on the lower bearing by using the predicted upper wind speed limit. “Allowable material stresses and safety factors then clearly led to the structural requirements for the design,” Roberts adds. The bending load at deck on the main mast, for instance, is about two-and-a-half times that of a Dreamliner aircraft wing and about two times that on Maltese Falcon, which has the highest-loaded freestanding masts to date. To put it another way, the masts can withstand 90 knots of wind with full sail up (equivalent to a Category 2 hurricane), or two double-decker buses hung from the tip of each. Magma built the masts using conventional female moulding techniques using high-strength carbon/epoxy prepreg laminate. Each mast was produced in four large sections: top and bottom, port and starboard. In the lower sections, 370 layers of carbon were laid up in open moulds. For the curing, Magma designed and manufactured oven software to monitor and control the cook cycle over a three-day period. Embedded in the masts is a network of fibre-optic sensors to give real-time comprehensive load data for safety, historical data, condition monitoring and sail performance optimisation. The total sail area of 3,747 square metres is equal to the size of half a football pitch, and is 67 per cent larger than Maltese Falcon’s 2,370 square metres. Unlike the many small sails that deploy from Falcon’s mainmast, Sailing Yacht A’s fully battened mainsail, at 1,464 square metres, is a single piece and furls on a carbon-fibre mandrel inside a U-shaped boom atthe press of a button; no crew are required. The total length of fibre used in the sail is 754 miles, or long enough if pulled straight, to stretch from the shipyard in Kiel to Monaco. The sails, by Doyle Sailmakers of the US, are a combination of carbon and Technora fibres and covered with taffeta to protect them from UV. The trick was determining compression loads on the battens and then engineering a soft inboard end capable of furling reliably but, at the same time, handling the forward thrust of the battens without tearing. Future Fibres, in Valencia, constructed the carbon-fibre booms, which measure 25 metres (foresail), 27.5 metres (mainsail) and 23.6 metres (mizzen). Germany’s GL Yachtverglasung (GLY) developed the yacht’s glass, including the longest piece of curved glass ever made: a 1.8-tonne, 15 metre bulwark forward on the bridge deck. “The designer wanted to make the look as clean as possible and preferably without railings. The only way to make invisible railings was to make them out of glass,” explains Kloosterman. Two other huge glass bulwarks are found on deck seven, at 11 metres in length, and forward of the owner’s deck, at 14 metres long. 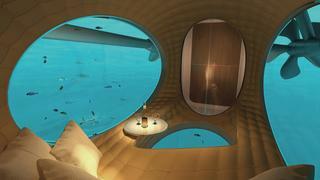 GLY also supplied three elliptical-shaped pieces for the underwater observation pod that is moulded into the keel. By using special GLY-MarineCobond interlayers during lamination, the company reduced the glass thickness and weight by as much as 50 per cent compared to typical windows. Meeting Lloyd’s requirements that the underwater windows had to be tested at 10 times the working pressure took a bit of ingenuity. 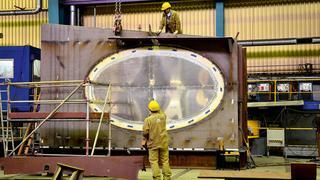 GLY built a steel tank and bolted on the observation pod windows then moved this assembly to Bodensee on the southern border of Germany and sunk it to the bottom of a 120 metre-deep hole to create the adequate pressures. The nearly foot-thick windows passed the test. Germany’s GL Yachtverglasung (GLY) developed the yacht’s glass, including the longest piece of curved glass ever made: a 1.8-tonne, 15 metre bulwark forward on the bridge deck. “The designer wanted to make the look as clean as possible and preferably without railings. The only way to make invisible railings was to make them out of glass,” explains Kloosterman. Two other huge glass bulwarks are found on deck seven, at 11 metres in length, and forward of the owner’s deck, at 14 metres long. 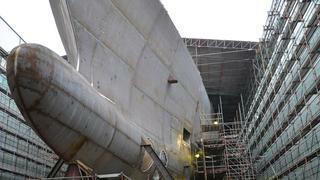 GLY also supplied three elliptical-shaped pieces for the underwater observation pod that is moulded into the keel. By using special GLY-MarineCobond interlayers during lamination, the company reduced the glass thickness and weight by as much as 50 per cent compared to typical windows. Meeting Lloyd’s requirements that the underwater windows had to be tested at 10 times the working pressure took a bit of ingenuity. GLY built a steel tank and bolted on the observation pod windows then moved this assembly to Bodensee on the southern border of Germany and sunk it to the bottom of a 120 metre-deep hole to create the adequate pressures. The nearly foot-thick windows passed the test. One of the most important design factors was keeping the weight down as much as possible, so the choice of propulsion was key. The goal was to achieve a cruising speed of 16 knots and a 21-knot top speed and be able to sail silently. The solution was unlike any ever installed on a yacht: a customised diesel-electric system. Building on a basic concept from river cruisers, EMS in Hamburg developed this system and then MTU, together with Vacon and DEIF, took it further. “We use variable-speed generators,” explains Kloosterman. “This means that we can get more power out of a generator because we can run up to 2,050rpm (giving 2,800kW) and the advantage is that instead of requiring five generators we only need four. This means a large saving in weight but also in costs of purchase, installation, operation and maintenance. The generators can also spin down to 1,050rpm when load is less; the Superimposed System Controller (SSC) constantly calculates the optimal speed and determines the best combination of generators on line. For example, the SSC may ascertain that at a particular electrical load it is more fuel efficient to run two generators at 1,200rpm than run one generator at 2,050rpm. Running two at a lower speed can have many advantages such as reduced noise/vibration, reduced overall fuel consumption and reduced engine wear.” Maintenance intervals will almost certainly increase, says Kloosterman, from 15,000 hours to as much as 30,000 hours. The pair of propellers can be driven by the twin MTU 20V 4000 ML73 main diesel engines or by electric motors or by a combination of both through clutches and gearboxes. The same electric motors can also be used as economical shaft generators when the main engines are driving the yacht. “There are a variety of separate propulsion modes to suit the requirements of cruising and sailing; the propulsion system is very flexible, and I believe this is the future of yacht propulsion,” Kloosterman says. One of the most important design factors was keeping the weight down as much as possible, so the choice of propulsion was key. The goal was to achieve a cruising speed of 16 knots and a 21-knot top speed and be able to sail silently. The solution was unlike any ever installed on a yacht: a customised diesel-electric system. Building on a basic concept from river cruisers, EMS in Hamburg developed this system and then MTU, together with Vacon and DEIF, took it further. “We use variable-speed generators,” explains Kloosterman. “This means that we can get more power out of a generator because we can run up to 2,050rpm (giving 2,800kW) and the advantage is that instead of requiring five generators we only need four. This means a large saving in weight but also in costs of purchase, installation, operation and maintenance. The generators can also spin down to 1,050rpm when load is less; the Superimposed System Controller (SSC) constantly calculates the optimal speed and determines the best combination of generators on line. For example, the SSC may ascertain that at a particular electrical load it is more fuel efficient to run two generators at 1,200rpm than run one generator at 2,050rpm. Running two at a lower speed can have many advantages such as reduced noise/vibration, reduced overall fuel consumption and reduced engine wear.” Maintenance intervals will almost certainly increase, says Kloosterman, from 15,000 hours to as much as 30,000 hours. The pair of propellers can be driven by the twin MTU 20V 4000 ML73 main diesel engines or by electric motors or by a combination of both through clutches and gearboxes. The same electric motors can also be used as economical shaft generators when the main engines are driving the yacht. “There are a variety of separate propulsion modes to suit the requirements of cruising and sailing; the propulsion system is very flexible, and I believe this is the future of yacht propulsion,” Kloosterman says.